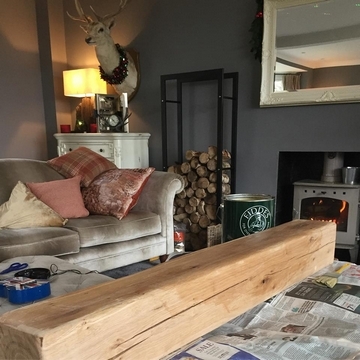 In our opinion, there is no feeling more satisfying than installing a beautiful, natural oak product as the centrepiece of your living room to create an elegant and charming oak beam fireplace. 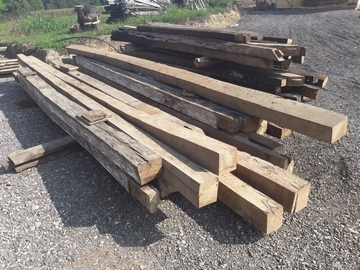 The vast majority of oak beams that we sell are unfinished. 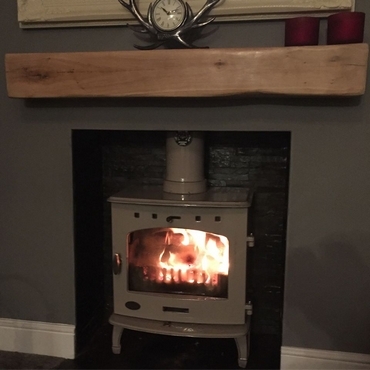 This means that, with a little DIY skill, some planning and quiet a bit of sanding and a little Danish Oil or Coloured wax, you can create a ready to be installed mantle. There are obvious practical and aesthetic implications based on the beam's cross section size. Whilst oak beams look great in modern, contemporary living rooms as well as characterful, cottage living rooms, you may find that a certain size cross section suits your space better than others. Take your time to browse through our Oak Beams to find a room and a style that best matches yours. The popular contemporary finished oak beams have been planed, sanded and had the corners rounded to remove sharp edges. This finish allows the beauty of the oak beam to shine through in its most natural form. The next decision is the beam's length. This one is pretty straight forward and can be anything from 900mm (approximately 3 ft) to 2400mm (nearly 8 ft) and anything in between. How your oak beam fireplace is finished, along with what oil or wax you use (but let's not get ahead of ourselves with that one, we'll save that for number 5) probably have the largest impact on the final aesthetics of the beam. What oil you choose to finish your oak beam, makes a big difference to how the beam will look over your fireplace or log burner. The standard oil that we recommend is Danish Oil, which is easy to wipe on, protects the oak and adds a slightly darker tone to your oak beam. Should you wish to maintain the beam's original tone, we recommend Clear Briwax. Finally, if you wish to alter the colour of the oak to match your room, there is a great range of Coloured Waxes or Oils. 6. (Bonus) Will my oak beam fireplace crack after I install it? All of our beam fireplaces are from air dried oak beams. The air dried process reduces the oak's moisture, meaning that the cracks that form will be less deep than with green (unseasoned) oak. However, as the oak acclimatises to your home and your central heating, cracks can form. Cracks do tend to add the beauty and the character of oak beams and are usually nothing to worry about. 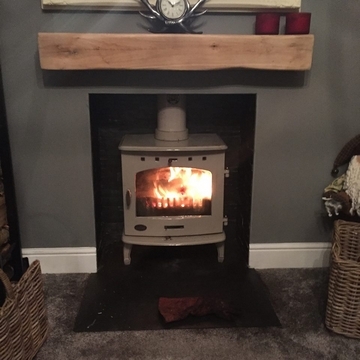 To further reduce the impact of beam cracks, we recommend that your oak beam is slowly introduced to the room where it is going to be displayed over a couple of weeks before installation and certainly before lighting any fires underneath it. Whatever type of mantle you are looking for, at Ace Reclamation is a great place to source your timber.